We get calls all the time from people asking us for handcycles. Most models are custom built which makes it difficult to keep one in stock. When I heard the Sun was going to come out with an affordable handtrike I knew we'd have to get some in. 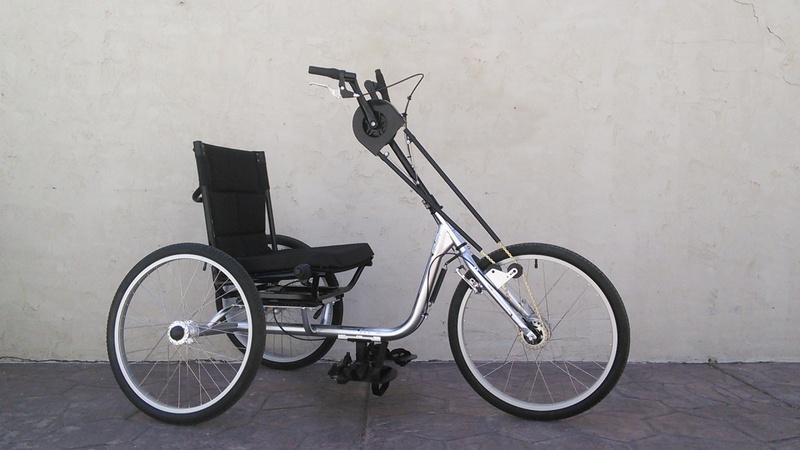 I've personally been interested in handcycles since I got into triking. I felt like a handcycle would give me the upper body workout that I wasn't getting from my regular riding. That probably seems strange since hand cycles are typically intended for people with limited or no use of their legs. Since I do most of my riding on a trike, my legs get the major workout and I've always wanted a more balanced workout. 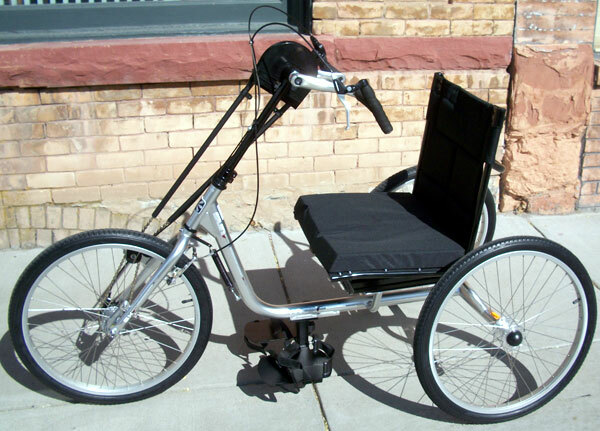 The HT3 SX hand trike is very well built. 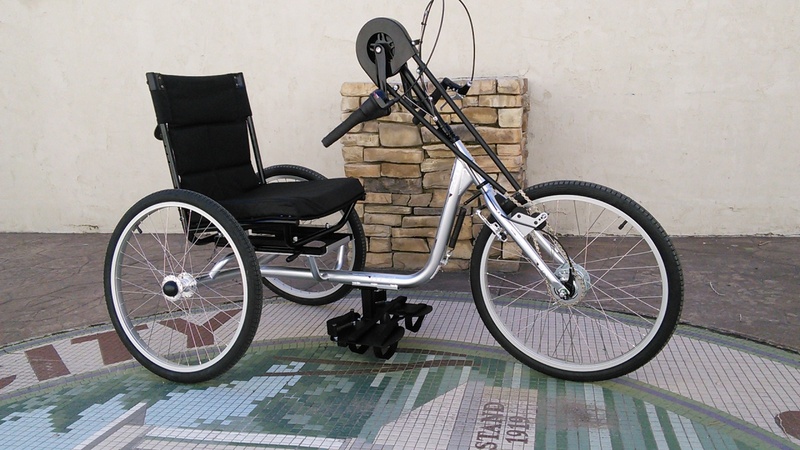 It features a lightweight chromoly steel frame construction and a very comfortable seat. 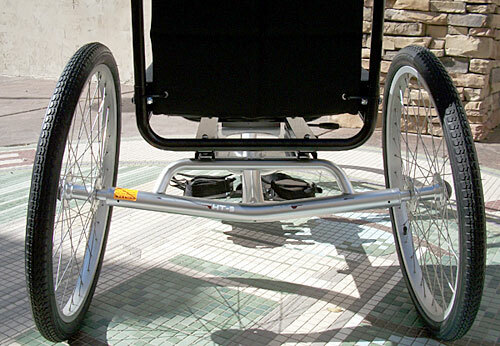 The appearance of the HT3 is similar to that of a wheel chair with the addition of a hand crank on the front. The seat position is adjustable so you can adjust for your arm length. There is a lot of padding on the bottom and back of the seat. The foot platforms are independently adjustable for height. If needed, there are foot straps on each platform to secure your legs. The front crank also serves as the steering mechanism. The height of the crank is adjustable, but the chain length needs to be set for the height. 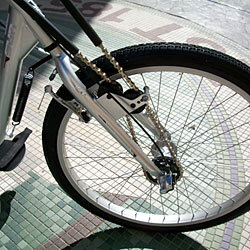 The cranks are both set in the same direction (unlike a bicycle) so that the pushing force is the same on both side. 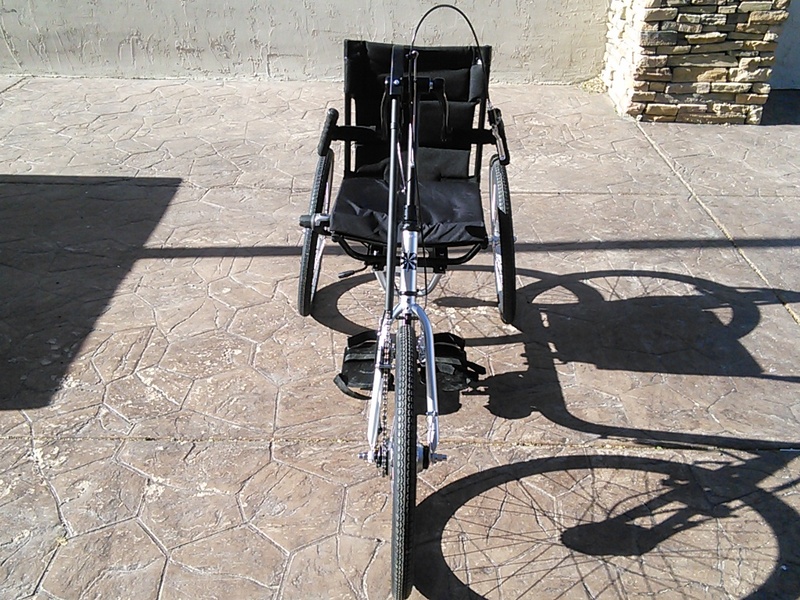 A lot of people ask us about this so I'll tell you that it is the preferred way to pedal a handcycle. The cranks also include the shifter and hand brake. There is a cable mount running along the front of the steering mast that is supposed to keep the cables from pointing up and out of the way. The gearing on the HT3 is very simple. There is a single chainring mounted to the crank with a protective cover. The chain runs from the crank down to a Nexus 3-speed internally geared transmission hub. While simple, the gearing is woefully inadequate. The low gear is not low enough to climb most hills and the high gear is barely high enough for level ground. The shifter placement is awkward to use while pedaling. If you ever let go of one of the cranks while pedaling the cable will get pulled on. 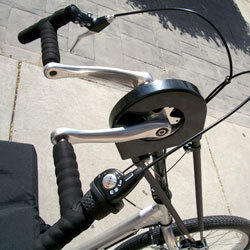 In my own riding and our in-store demos the shifter cable has not lasted long which turns the trike into a 1-speed. The braking system is effective, but could be perfected. The 3-speed hub has a coaster brake which is actuated by turning the cranks backwards. This proves to be a very intuitive method of stopping the trike. When you are coasting you can just rest your hands on the cranks and just rock them back to slow down. In addition to the coaster brake there is a front rim brake connected to a lever on the crank. This lever has the same issues as the shifter cable and I ultimately removed it. The coaster brake seems more than adequate to stop the trike. On a faster version I'd like to see some rear brakes. Steering the trike is very easy. I am very impressed with how well it takes corners at faster speeds. The HT3 features a self centering spring which eliminates any pedal wobbling. Even in a sharp turn I never feel like I will tip over despite the higher seat height. The chain is routed through a set of idler pulleys to allow the wheel to turn for steering. The chain rolls very smooth, but some better idlers would really quiet it down. The crank height is used to adjust the chain tension which works very well. I think the stock setup of the HT3 is very good for the low price of this trike. Moving the shifter and brake lever off the crank to eliminate the cable issues would be my number one recommendation although others may not have any issues with them. I've had a lot of fun riding the HT3 and am including it as part of my weekly workout regime. A three mile ride takes about half an hour and feels like I did a whole hour of upper body circuit training at the gym. With the stock gearing I've limited most of my riding to the flat areas. For my purposes I will be doing several upgrades. An 8-speed transmission is the first. I think 8 speeds will be just the right amount for now until I start taking the bigger hills, and in the meantime will allow me to raise my top speed by a few miles an hour. I will have to try several shifter positions to see what I like best. I will most likely remove the hand brake completely and just use the coaster brake. I think there is a lot of potential with the HT3 and if you are looking for an inexpensive handcycle you won't be dissappointed.